Click on an random link in Safari (especially one with images, or google maps) But not all the time as I am posting here on the system in question. Sometimes (if I am lucky) I can still see a mouse pointer and shutting down safari clears the issue. At other times I am forced to power off blindly and at those times it can take 2 or 3 hard reboots to clear the issue an get to a working login screen. It turns out that there is a known issue with early 2011 Macbook Pro's displays and that Apple is going to replace the logic board for free. This is outside of Apple Care. This program will end sometime in the future (I did see 4 years after date of purchase mentioned on the Apple site), but even if you don't qualify for a fee replacement the cost of replacing the logic board is only in the order of $USD300 - a lot cheaper than a replacement laptop! Proposed Resolution: Replace logic board under quality program. Not the answer you're looking for? 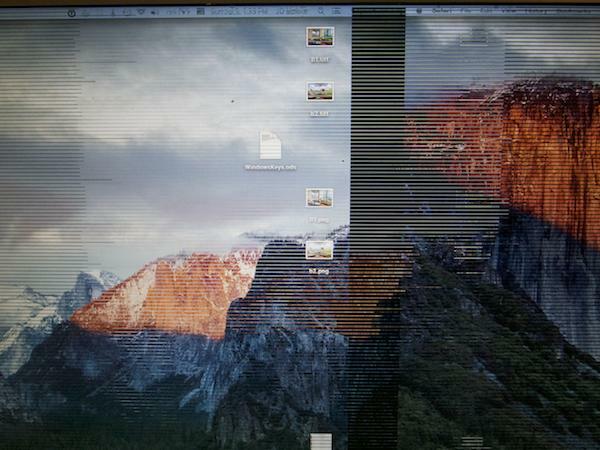 Browse other questions tagged macbook display crash . Is it possible to have pixelated graphics on a MacBook Pro due to a defunct trackpad? How to get MacBook Pro(early 2011,13 inches) logic board schematic? My MacBook Pro is crashing with kernel panic. What would be the reason?